Some days ago, looking over my day, I felt I hadn’t lived it as well as I should. Yet, it wasn’t enough that I saw my less-than-perfect reactions to situations; I wanted to feel its burn deep in my soul. I wanted to really feel remorse for any wrongdoing. And so I prayed for that. For the forgetfulness and ingratitude of men, we will console You, O Lord. For the way You are deserted in Your holy tabernacle, we will console You, O Lord. For the crimes of sinners, we will console You, O Lord. For the hatred of the impious, we will console You, O Lord. For the blasphemies uttered against You, we will console You, O Lord. For the sacrileges that profane Your Sacrament of Love, we will console You, O Lord. For the outrages against Your divinity, we will console You, O Lord. For the injuries of which You are the Adorable Victim, we will console You, O Lord. For the coldness of the greater part of Your children, we will console You, O Lord. For the contempt of Your loving invitation, we will console You, O Lord. For the infidelity of those who called themselves your friends, we will console you, O Lord. For the abuse of Your grace, we will console You, O Lord. For our own unfaithfulness, we will console You, O Lord. For the incomprehensible hardness of our hearts, we will console You, O Lord. For our long delay in loving You, we will console You, O Lord. For our tepidity in Your holy service, we will console You, O Lord. For Your bitter sadness at the loss of souls, we will console You, O Lord. For Your long waiting at the door of our hearts, we will console You, O Lord. For the heartless scorn that grieves You, we will console You, O Lord. For Your loving sighs, we will console You, O Lord. For Your loving tears, we will console You, O Lord. For Your loving imprisonment, we will console You, O Lord. For Your loving death, we will console You, O Lord. Let us pray: O Jesus! Divine Savior, from whose Heart comes forth this bitter complaint, “I looked for one that would comfort Me, and I found none,” graciously accept the feeble consolation we offer You, and aid us so powerfully by Your grace, that we may, for the time to come, shun more and more all that can displease You, and prove ourselves in everything, and everywhere, and forever Your most faithful and devoted servants. We ask it through Your Sacred Heart, O Lord, who live and reign with the Father and the Holy Spirit one God, world without end. Amen. Since that day Console Me returned, the Angel has led me to His tabernacle at the unlikeliest times. I use the word ‘led’ because I know it’s not me. Every time I awaken in the middle of sleep, I immediately remember, Console Me. When I have a few stolen minutes between tasks, in the sudden quiet that descends, Console Me instantly looms before my heart. This is improbable of me. And certainly not at a time like now when I come from work so tired I can barely think, when my head is so full, my hours too short. And yet, the second Console Me calls, everything that matters falls away, fading in a suddenness. In that instant, nothing of this earth stands. This morning, during quiet minutes, I suddenly thought of The Angel of Peace. A seer has often mentioned that The Angel of Peace will come soon. I wondered who might that be. If it were any of the archangels – Michael, Gabriel or Raphael – I wonder why his name has never been pronounced. I know the dangers of attaching too much credence or belief to a visionary or seer. I remind myself of the dangers, because these are indeed dangerous times of confusion. I do not want to go the way of many who waited for the proclaimed time, but the wait was in vain. Yet, the words, Angel of Peace slipped in when much of the world was still asleep today, and it lay quietly on my heart. Along with it came unbidden a memory, worn soft with age, tears and old love. A memory of an angel~love that never had need of words when I needed comforting. Tender softness against my heart when I was tossed about by some wild wind of ache and tears, a softness that alone had the power to ease any storm. This love gave me a peace each time it came. A peace that was soft, gentle yet strong. It has now been very long since I’ve felt this peace. The old days have not returned yet. My thoughts returned to the Angel of Peace. Who are you? I asked. And then I went to my day, the hours soon became lost in whorls of busyness. I returned home as a golden orange flush gently swelled the warm evening skies. I should have been out, in the fading lisp of the aging day, quietening my heart as the day bade farewell. But too tired and in some pain from a foot injury, I stayed in and stole glances at the soft beckoning of the tangerine sunset. There was something in the eyes of the sky. An odd quietness, deep and alert, in the distant western abode where the sun goes to die each day. It was as if something or someone was waiting for me. But the demands of family and home shifted impatiently beside me and I could not go to the bidding of the waiting skies. When I didn’t go to meet that strange, secret quietness, it came towards me. I suddenly remembered that as I had awakened late that day, I hadn’t had the time to go to my daily readings and then to my prayer nook for my day’s prayer. So, I hastened to the Bible. And from there to my prayer nook. One saint I’ve never gone to before was waiting for me and she held out something to me now. St. Gertrude had misted by pretty often of late, and while I had never reached for her hand, today, she had a prayer for me. which you have ever bestowed on me in body and soul. and most faithfully to serve my God. Amen. It could have come on any day, but this prayer came today when my thoughts were on The Angel of Peace. A tough day awaits me but I seem to be held safe in an invisible embrace of peace and stillness. 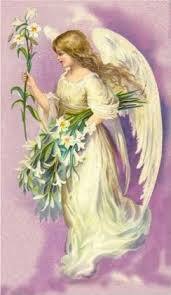 Unhurried, I recall once more the angel~peace of old, still and quiet. I think of those have been granted the grace of seeing their guardian angels and I think about how their lives must have changed since then. Because no one is ever the same once they have seen those who share our lives, yet are not of this world. Blessed be those hours of grace when we saw. I made a slightly more fussy chicken dish for Sunday lunch today. I liked the chicken the first time I tasted it cooked this way at a little corner street dinner run by an Indian Muslim of few words but with quiet, watchful eyes. Compared to the other eateries that line both sides of that busy shopping street, his was understated, clean, the clientele more likely to be busy office workers out for a quick lunch, heads barely raised over their plates, than teenage kids who place a higher premium on ambience and address, and who, thus, rarely made a beeline for this man’s restaurant. This quiet man had two or three equally quiet workers, all South Indians, I suspect. They didn’t speak the local language, knew little English but they knew the currency well so there were no problems. The restaurant owner only cooked up a few dishes and a soup each lunch time. Simple food cooked from the heart but they were hearty fare. And one of those dishes was his South Indian peppery chicken dish which made up our Sunday lunch. The first time I ate it was after a tiring day of shopping, and in a mood not improved by hunger, worsened by the crowds that took up every seat in every other restaurant. But this little eatery beckoned. Simple seats, small tables, clean floors. Quiet waiters. An even more quiet chef who stood afar and watched us discreetly as he washed up his pots and pans. With the busy street just a few feet away, the quiet of the restaurant was a stark contrast to the rushing and honking all around us. It felt almost like a hidden world that lived alongside busyness and mayhem. And that day, this man’s chicken touched something deep within me. I’ve never been much of a cook but with a house full of small children with huge appetites, I have little choice but to learn to cook decent meals and to cook them fast. I had the usual go-to chicken recipes but I was on the lookout for something new and the chicken this man made that day was different. I knew he had made it right there in a massive wok in a cubicle just off the seating area but it tasted like it had been cooked in aging stoves in old kitchens with big windows, surrounded by huge trees that waved the sunny breezes inside. The hearty meal took the rough edges off the day, and quietened me enough to savor the peace of the little diner. The following week, staring at the freshly cut chicken in front of me, I decided to recreate the chicken dish I could barely get out of my head. It turned out well, and it has, each time I’ve cooked it. 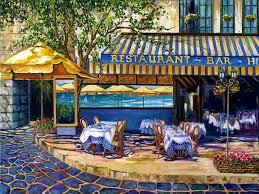 Some years later, hankering for some more from him, I made my way back to the eatery but he was gone. I stared dumbly at the restaurant in its place, its new waiters meeting my eyes sullenly. More than his chicken, I missed the island of quiet he had created, the gentle comfort of good and reasonably priced food, the way he helped me realize I didn’t need to follow the crowd in its frazzled rush. In that little space off the crazy street, he offered respite that rested tired feet and hearts. Quiet and unassuming, he did the work of angels. I turned away in disappointment wishing I knew where the quiet chef had chosen to bloom anew in quietness, offering an angel’s pit stop to refresh those who heaved around dusty and wilting spirits.